Here is another unusual Baseball related item I found on eBay recently. It is so unique and unusual I decided to make some aggressive bids to win it. Unfortunately, I was outbid. Above is a larger sized business card from the early part of the 20th Century. 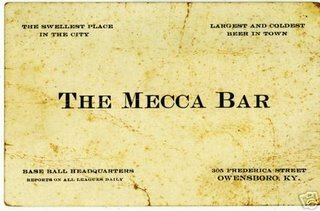 It's a calling card for a establishment called "the Mecca Bar." It is the Baseball headquarters for Owensboro, Kentucky. No doubt it is the "swellest place on earth." 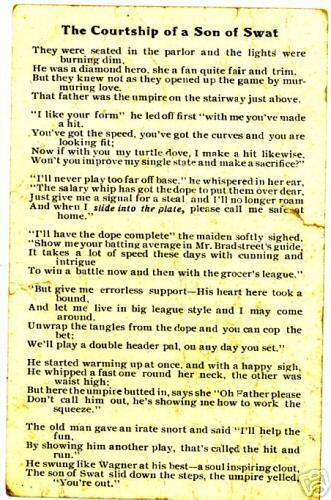 Also, on the back is a poem that mentions the great Honus Wagner. As the seller notes, Wagner's mention is not a coincidence. He was one of the most popular players in the late 1800's and early 1900's. Furthermore, before Honus Wagner starred in Pittsburgh he played ball for the National League Louisville, Kentucky club. Therefore, it makes sense that this bar would hold Honus is such high esteem. They were seated in the parlor and the lights were burning dim. He was a diamond hero, she a fan quite fair and trim. But they knew not as they opened up the game by murmuring love. That father was the umpire on the stairway just above. "I like your form" he led off first "with me you've made a hit. Won't you improve my single state and make a sacrifice?" "I'll never play too far off base," he whispered in her ear. "The salary whip has got the dope to put them over dear." And when I slide into the plate, please call me safe at home." "Show me your batting average in Mr. Bradstreet's guide. to win a battle now and then with the grocer's league." "But give me errorless support- His heart here took a bound. And let me live in big league style and I may come around. We'll play a double header pal, on any day you set." He started warming up at once, and with a happy sigh. Don't call him out, he's showing me how to work the squeeze." The old man gave an irate snort and said "I'll help the fun. By showing him another play, that's called the hit and run." He swung like Wagner at his best- a soul inspiring clout. 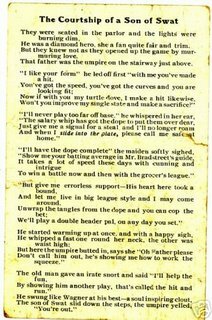 The son of Swat slid down the steps, the umpire yelled, "You're out."